Yeah, we’re a third of the way into March. I spent the first week of March at a writing workshop, which I might blog about separately. My writing workshops are basically 14-hour days, because if you’re not working why did you leave the house? Anyway, how did February measure up? I spent the first third of the month finishing the first complete draft of FreeBSD Mastery: Jails and sending it for ready for tech edit. That’s where most of the words came from. The middle third of the month was spent dismantling the first edition of Sudo Mastery, crying reading sudoers, and assembling the outline of the new edition. This is a little tricky, as I need to retain what made the first edition so amusing but update it for 2019. Words were made, but none of them are saleable so they don’t count–like this blog post. The last third went to collecting FMJ tech edits and integrating them into the completed manuscript. FMJ is at the copyeditor now, and is due back by the end of the week. I expect to have print copies for Penguicon or, at worst, BSDCan. With any luck I’ll have hardcovers by then too. That leaves me this week to do creative crap. I have a story due for Boundary Shock, so that needs to get drafted and out to first readers. I also have an absolutely business-critical task that I must finish this week. Can’t say what it is yet, but here’s a hint. So if you excuse me, I better pour a glass of milk and get scribbling. In 2017, I bought a block of one thousand ISBNs. Other authors have been asking me why I did that and if they should do the same. I’m writing this blog post so I can point them at it. The short but glib answer is, when the missed opportunity cost of piggybacking on Amazon’s (previously CreateSpace’s) free ISBNs exceeds the expense of buying your own ISBNs. But let’s break this down a little more. Most indie authors don’t sell many books. If you have only one or two titles, don’t even think about getting your own ISBNs. Spend your money on editing your next book. If your book does sell, chances are it only sells on Amazon. Amazon doesn’t care where an ISBN comes from. I imagine they’d happily ditch ISBNs, except for that pesky Expanded Distribution to the wider world of bookstores. And that wider world of bookstores is where your own ISBNs come in. the owner of the ISBN controls where the book can be printed. If your ISBN comes from Amazon, you can only get your book printed at Amazon. Your own print run might seem ambitious right now, but while the plan “I’m gonna sell a million copies a year” might not be realistic, the plan of “If I sell a million a year I want to do it in the least profitable way” is just plain daft. Just as you have a backup plan in case of failure, have a route open to maximize success. So how did I make this calculation? One, I was being directly contacted for bulk orders on books in locations I couldn’t serve. I could drop-ship books from CreateSpace US, but many of these orders came from overseas. And CreateSpace wouldn’t put customs paperwork on overseas shipments, so I’d have to have the books shipped to me, prepare the customs paperwork, and ship them over to Europe or Asia or wherever. The shipping costs on orders of even 20 books were prohibitive. The cost of a lost opportunity. Additionally, my Expanded Distribution sales were growing. ED pays about 40% of cover price on sales. IngramSpark lets you set your own rate, but “50% no returns” is perfectly acceptable. That’s an extra 20% on each unit sold. I counted my annual sales through Expanded Distribution. I figured out how many ISBNs I needed to buy. I assumed that I’d get an extra 15% on each ED sale (because I’m pessimistic), and that sales would go they way they had for last few years (because I had to pick a value). Yes, these are fragile assumptions. When the calculation showed that the increased proceeds from IngramSpark sales would pay for the whole block of ISBNs in about a year, and everything after that would be extra income, I bought my ISBNs. How did I decide how many ISBNs to buy? I averaged how many titles I publish in a year. Multiplied that by the number of writing years I hope to have left. The math said I’d need a little less than 300 ISBNs. As I’m in the US, it was cheaper to buy 1000 ISBNs than 300, because Bowker is milking the US ISBN market for every last penny. I am now done with the ISBN problem forever. FOREVER. To my shock, the investment paid off in three months. My unit sales almost doubled. 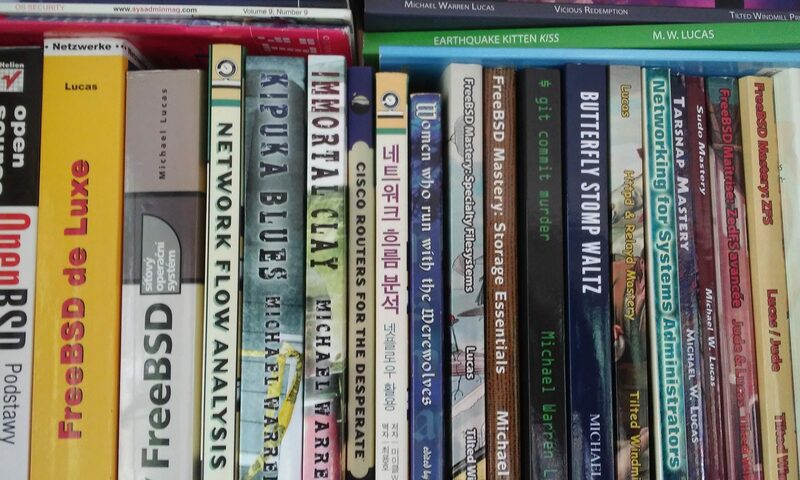 My books sell in places they never could reach before, mostly in Asia. I sell print books in Malaysia and India. Will that happen to you? Dunno. It won’t hurt your sales, though. And I have enough to experiment with things like hardcover books. Which, to my surprise, sell. Even in Asia, where they’re not merely expensive but fiendishly expensive. Once you have your own ISBNs, the real fun begins. You need to re-issue all existing titles under your own ISBNs, so that you can control the printing. This is vital. Someone that wants to order your book will look up the title in their online system and order it by ISBN. If you have one version of the book on Amazon with one ISBN, and the identical book with a different ISBN in IngramSpark, who knows what they’ll wind up ordering? Basic business says you must have a consistent product line. When two hundred people order your book, you don’t want them either getting two different products or, worse, half of them unable to get your book because it’s not available in their area under that ISBN. This means you need to prepare for success. Changing your ISBNs means changing your book interior. Adding IngramSpark as a printer means changing your cover. Yes, your cover and interior designers are professionals and would never screw you over. Maybe your designer is a dear friend or an award-winning master with a sterling reputation. But people get hit by busses, leave the field, or eaten by antelopes all the time. If nothing else, there’s retirement. You need not only the finished product, but the source files for them as well. (Some designers will offer digital escrow services, which can be okay so long as it’s at their expense.) When the time comes for you to update fifty titles with your own ISBN, the last thing you want to have to do is redo the covers of your best-selling series because you can’t change shift the design as needed to match IngramSpark’s requirements. You want to have your designer or their successor open the original design, shift a couple items a millimeter or two, and be done. Do the math now. Figure out how many you need and what the cost would be. Once you know the answer: forget about it until you hit those numbers. Put your energy and your worry on the thing that you can control: your craftsmanship and the amount of time you spend making words. Because making words is how you get to have problems like needing your own ISBNs. So many people over the decades have volunteered to slash my neck for free, but I’ve decided to have a professional do it. My long-time stalkers followers have probably noticed my declining output. In 2016 I released six big books. Last year, two. This year, I’m pushing hard to get three, and I probably won’t succeed. I’ve been plagued by weird, seemingly unrelated health problems. I’ll spare you the tedious details, but the real problem is that my writing speed hasn’t been where it needs to be. I’ve been going to quite a few doctors trying to figure out the root problem. Thought it was anemia. Got that patched over, sort of, but there’s other symptoms. Also, what caused the anemia? On 10 December, they’re cutting me open to yank out the right side of my thyroid and the accompanying 22-centimeter cyst. At least, that’s the plan. The surgeon might open me up and realize that the whole thing has to go, as some problems aren’t visible until you lay eyes on them. MRIs and ultrasounds are miraculous, but nothing replaces the squishy cameras mounted at the front of your head. Part of me hopes they take it all. It’s hard to say how long the thyroid’s been bad; “constantly feeling vaguely unwell” is a common side effect of a career in systems administration. The thyroid is your master gland and controls your whole body. It’s also a tricky bugger to diagnose, at least until it starts swelling. I don’t know that my thyroid is the true root cause, but the list of standard thyroid symptoms includes most all of my non-personality problems. What will happen next? Dunno. Maybe I’ll come out just fine. Maybe I’ll need hormone replacement therapy. The more extensive the surgery, the longer it’ll take to recover–perhaps as long as three months. If they take half, there’s a 30% chance they’ll go back a couple weeks later and take the other half. I do know that this is a common surgery (except for the whole twenty-two centimeter thing), and that it’s completely routine for everyone but me. So, I’m doing the following. All public appearances are canceled until further notice. I’ll still be at semibug, but I’m not talking at any more user groups or cons until I’m well. I’m not even doing any more bookstore readings. The people involved already know. I’m not accepting any invitations for conferences until this is resolved. I usually get a flurry of invites at year end, but I’m deferring decisions until I’m stable. Even if I come through this perfectly I’m planning to stay home afterwords, put my head down, and write some damn books. That’s the only thing I’ve ever wanted as a career. I’m ridiculously lucky in that people will buy almost anything I write. If I want to keep this career, I have to produce. So, chances are I’ll turn down your con invite anyway. But hopefully it won’t be because I don’t feel well enough to travel; it’ll be because I feel finally healthy enough to disgorge the millions of words trapped in my brainstem. I’m also looking forward to being able to routinely turn my head to the right without blacking myself out. That’ll be nice. Also, if this leaves a big scar? Two words: zipper tattoo! The OpenBSD auction went to Jared for $1000, crushing poor Cybermonk. Cybermonk did triumph in the FreeBSD auction, however, with a top bid of $325. My condolences to those who lost the auctions. Remember, you can still donate and get that warm feel-good dopamine from being a good person. There’s three OpenBSD devs at MeetBSD. The auction for this first-ever hardcover signed by these folks is now up to $250. Among others, you’ll get an original Ayaka Koshibe illustration. The committer-signed Absolute FreeBSD 3/e is at $100. So, the OpenBSD fans are crushing the FreeBSD fans. Are you FreeBSD folks going to stand for this?